Nothing beats the sound of vinyl! 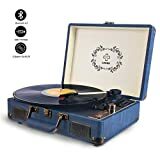 Whether you have inherited an awesome record collection or have started collecting your own as a hobby, records offer you authentic sound that can’t be beat. It is no coincidence that players are just as popular and the purchasing options can seem endless. From manual to automatic, record players offer a variety of driver and USB options. 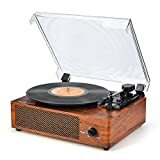 To make it much simpler for you, we have put together this record player shopping guide to get you listening to your favorite hit single in no time. Manual Record Players: If you find something magical about putting the arm down on your favourite record, finding the right groove and guiding it to play, then these are for you. 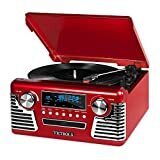 Manual record players are designed to replicate the ones of years gone by and give you full control. You, the listener, are in control of controlling the arm to play and lifting it off when your album has come to an end. 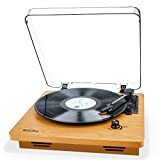 Automatic Record Players: Automatic record players give you a lot more flexibility as they automatically lift the arm when the album is finished, meaning if you are out of the room, or busy entertaining you won’t need to rush to your player. You are also able to play your record with a push of a button, as the arm will be able lower and find the groove on its own. This is a great player if you want the authentic sound but also modern convenience. Belt Drive Record Players: Almost all high-end record players have a belt drive which translate to better sound! The motor drives the platter (this is the part that holds the record and turns it) via a rubber belt with these record players, which simply means the belt acts as a shock absorber which prevents noise and vibrations reaching the platter. Less outside noise means means much easier listening. Direct Drive Record Players: Record players with direct drives don’t have have belts. The platter is connected to the motor directly. These offer much more consistent speed and very accurate sound making them great for DJ-ing. 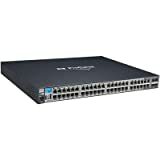 They are sturdy, and fast to start up and generally a good solid model you will be happy with. Upgrade options: Record players with upgradable options have much more user satisfaction than those that don’t. 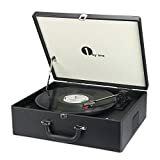 Being able to update the cartridge, belt, stylus (needle), tonearm, and slip mat (which replaces traditional rubber mat so that you can ‘slip’ the disc around the table for DJ-ing) will make your record player play for many years to come and give you more playing options. Assembling: Owners who found their record players easy to set up and balance and level for good sound are happy with their units. Being able to balance and level with ease gives you more time to enjoy quality sound from your record player. Tonearm adjustment: Tonearms have weights to ensure gentle but adequate initial contact with the record, and to provide appropriate pressure from the stylus to the record. Record players that have the ability to adjust tonearm weights and contact levels are rated much higher than ones that don’t. Wow and flutter: Unnoticeable wow and flutter is a top concerns for consumers. Owners with record players that have little to now wow or flutter rate their players much higher than those who don’t. Do you need a USB? 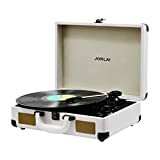 Record players with USB ports offer great functionality! If you need to digitize your vinyl collection efficiently, including those rare albums not available in mp3 or other digital formats, then this feature is a must. 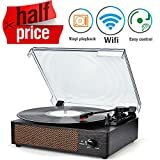 Record players without USB ports are cost effective and super value for money, so if digitizing is not a concern, these will be perfect for you. 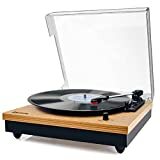 If you are looking to invest in a record player and want it to stand the test of time, it is good to check if the parts on your new record player will be upgradeable. These make it possible to upgrade cartridges, tonearms, belts or slip mats and will mean a much longer life for your player. The phono cartridge is the part of the player that holds the needle. Better quality cartridges mean better sound quality from your player because it is responsible for how your player tracks (how the needle rides the groove of the record). Checking the quality of the record player's cartridge will save you having to upgrade sooner rather than later. Be aware that some record players are sold without the stylus (needle). Look for a brand that includes this will save you hassle and extra costs. To play your record player sound through your sound system speakers, look at purchasing a receiver. Not all record players have an internal amplifier which allows you to plug speakers directly into your player. Wow and flutter is measured in decimals and the lower the better. This number tells you how accurately the record player spins on the platter (plate). Deviation in record speed will mean pitch changes and wavering effects that can disrupt the music. Anything lower than 0.25% is considered ideal for optimum sound. Pro-Ject: Pro-Ject, based in Vienna, Austria, manufactures good value for money equipment, including a line of entry-level record players. Crosley: In 1920, Powel Crosley introduced the first low price radio for mass consumption. Crosley Radio is now located in Louisville, KY and is a household record player brand.